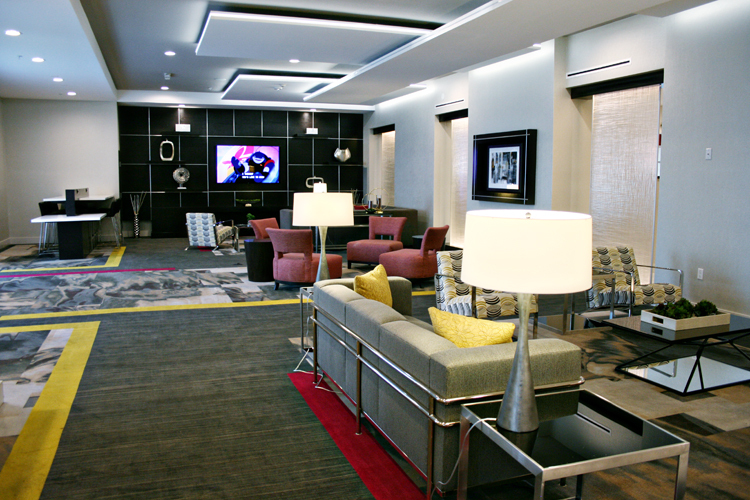 With about a 10 minute walk to the front gates of the Disneyland Resort in Anaheim, California the Holiday Inn Express is a great off-site hotel choice. 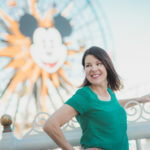 Our Day Trips TravelingMom recently visited Disneyland and stayed overnight with her extended family at the Holiday Inn Express located on Manchester Ave. 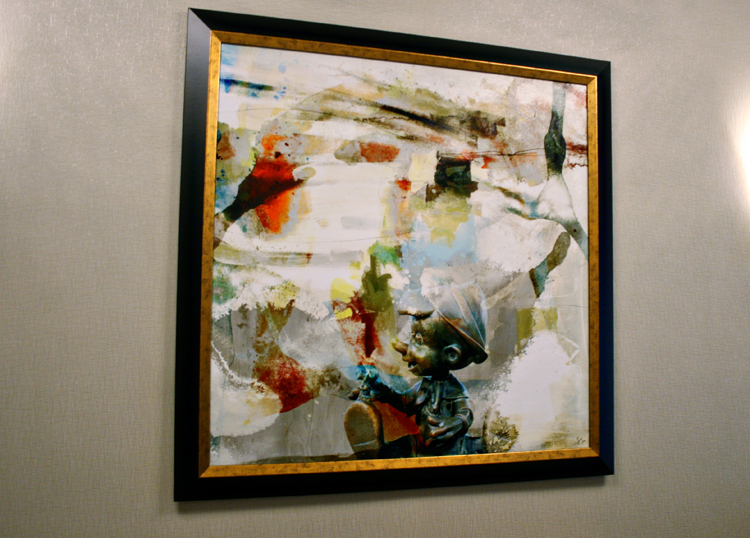 This Disneyland area hotel offers an upscale design, complimentary breakfast and ability to walk quickly to the parks, making this hotel an excellent choice. When visiting the Anaheim area, I usually prefer to stay on-site at a Disneyland Resort hotel to take advantage of the amenities. However on quick overnight visits, I usually opt for one of the many off-site hotels within walking distance of the front gates. With so many options (some better than others! ), I like to do my research and find out which hotels are well kept, have great amenities, and truly are walkable to the resort. No hotel shuttle available. Though it’s only a half mile walk from the Disneyland gates to the hotel, at the end of the day with a cranky kid, this might be just too far. Guests can choose to purchase a ticket on the ART shuttle if they don’t want to walk. Small parking lot means you might have to opt for valet in order to park the car. Cost is the same, $15 either way, so you might as well go with valet instead of searching for a spot. Loud noise from nearby fireworks may disturb those who are early to bed. Two Holiday Inn hotels are located on the same street in the Anaheim area. 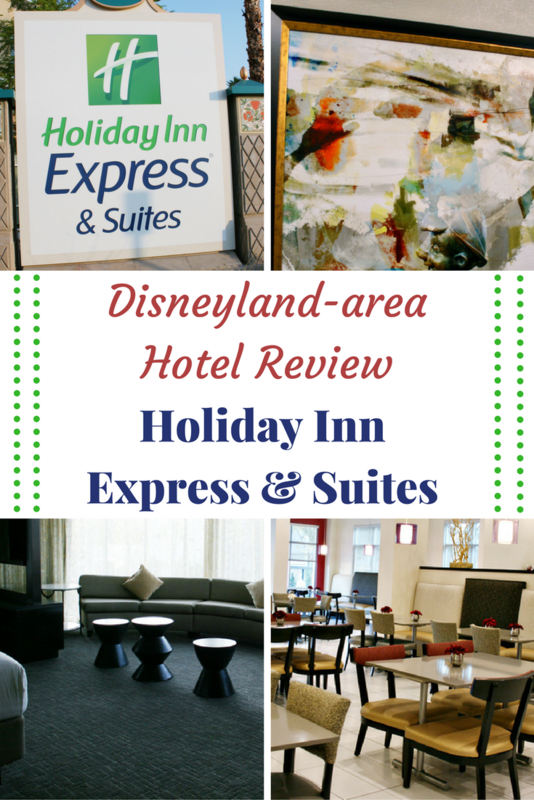 This Holiday Inn Express & Suites is the closer hotel to the Disneyland parks. The Holiday Inn Express website notes that the hotel is about a mile and a half from the entrance. I’ve walked it myself, and it didn’t seem quite that far. I doubted it so much I looked up a Google map, confirming it’s actually only a half mile away. So this hotel is really quite walkable within about 10-15 minutes. My visit took place mid-week in August when the hotel was very quiet and uncrowded. In fact, no other guests were present when we checked in (around 7 pm), highly unusual for Anaheim hotels any time of the year. Check-in was quick. By the time I had the room card in hand, the rest of my family had unloaded the luggage and the valet had taken the car. Guests of the Holiday Inn Express may purchase Disneyland tickets in advance at the hotel front desk (though Traveling Mom recommends purchasing upfront at a discount from Get Away Today – even better, save an extra $10 on a two or more night package with code TravelingMom. The lobby offered plenty of seating. Likewise for the adjacent dining area. 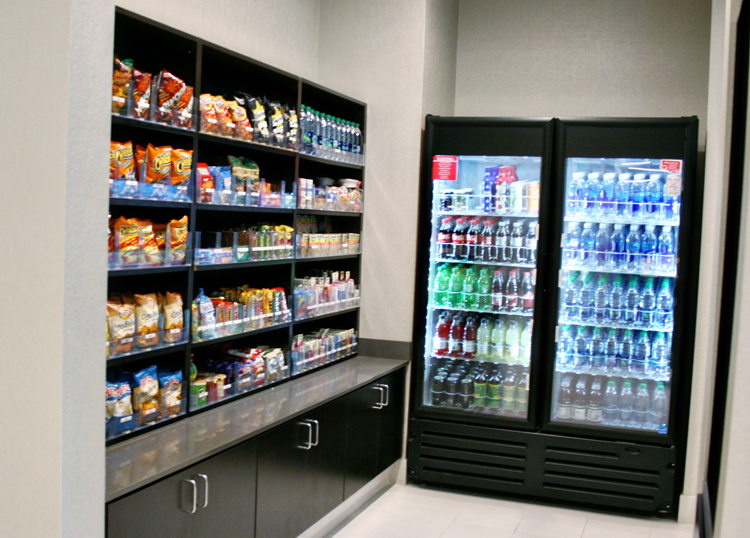 There is also a decent sized Marketplace Deli with items like bottled water and chips for purchase. So handy when returning back to the hotel late at night and you need a bedtime snack! 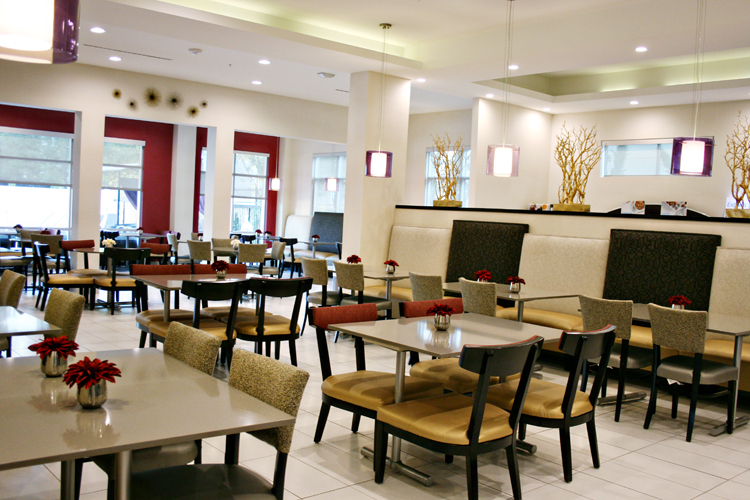 The Holiday Inn Express offers guests a complimentary hot breakfast that includes eggs, muffins, bacon, cereals and yogurt. You can even make your own pancakes if you have a bit more time. On the day of our visit, while I was feeding the baby and my mom was getting dressed for the day, my brother took my son down to the lobby to grab a few plates of food. They returned with a bounty that we shared. Our room had a Keurig single cup coffee maker so my mom was able to brew a cup to go. A complimentary breakfast can really save families so much money on vacation. And when there’s bacon, well that just makes my kids really happy! No other onsite restaurants, although a Mimi’s Cafe is just down the block and a few other options (Pizza Press, McDonald’s, Denny’s) around the corner. Our hotel room overlooked the freeway. I worried that there might be excessive vehicle noise. But the only time I ever heard any traffic was late at night when the room was very quiet, while I sat right next to the window. Even then, it was a very faint noise, nothing that I could hear once I was in bed. What guest will hear are the fireworks going off at Disneyland. At check-in, we’d been informed that we could watch the show from our hotel room window. At that time, we explored the Downtown Disney District during the fireworks show, so we didn’t test that. My family of five booked the penthouse suite, which really gave us more than enough room. It’s priced slightly more than a standard room, about $75 more, but worth it if you need the extra square footage (750 in the penthouse versus 400 in a standard). 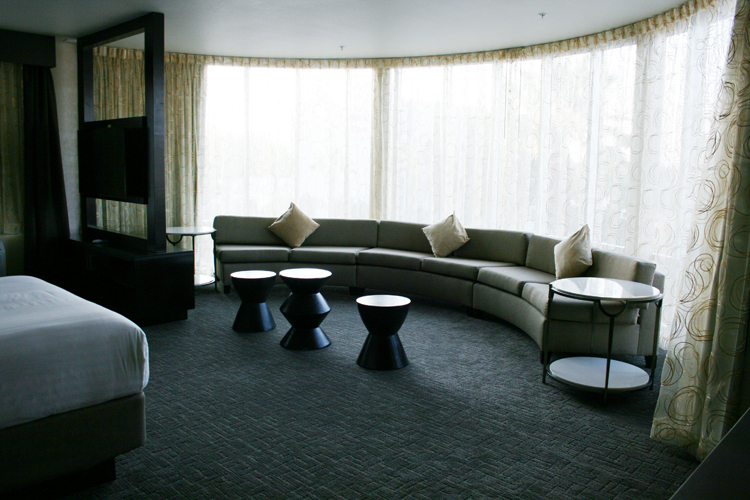 With floor to ceiling windows, the curved window seat arrangement, dual 48″ high-def televisions and quirky side tables, I felt like we should have been hosting a cocktail party in our room! The space was modern, with a chic decor. The window is enormous, and the curtains are equally huge. It took my mom and I a bit of time to figure out how to close them up for the evening as we were both too short to gracefully reach the pull rod. Let’s just say it took me climbing atop the curved sofa to get the curtains shut! In addition to the two queen beds, we required a crib for the baby. I requested that one be sent to the room before we headed out to dinner but when we returned for the night, it wasn’t there. A quick call to the desk with the second request, and the crib was brought up with ten minutes. Even with the crib in the room, we still had lots of space to move around. The room was stiflingly warm when we’d first checked in. Before we left for dinner, we turned on the air conditioning. By the time we returned, the room was pleasantly cool. With three adults and two kids, we were grateful for the extra space. However, without a place to set our luggage (we could not located a luggage rack in the room), we had to set things on the floor. We only had two bags so it wasn’t too much of a problem, but this might have been a bigger issue if we’d had a longer visit (ie: more stuff). There was a closet (that also held an iron and ironing board), but not much in the way of drawer space for clothing. Shelving units are located under the televisions for extra storage. We much appreciated the full sized mirror and desk where my mom and I could individually put on our make-up without bumping into each other. The bathroom was roomy and offered generous counter space as well. I’ll admit that I usually have a tough time sleeping in hotels. But not at the Holiday Inn Express! The beds were so comfy with two pillows (one soft and one firm) for each guest. This was wonderful as most hotel room pillows are generally sad and flat! 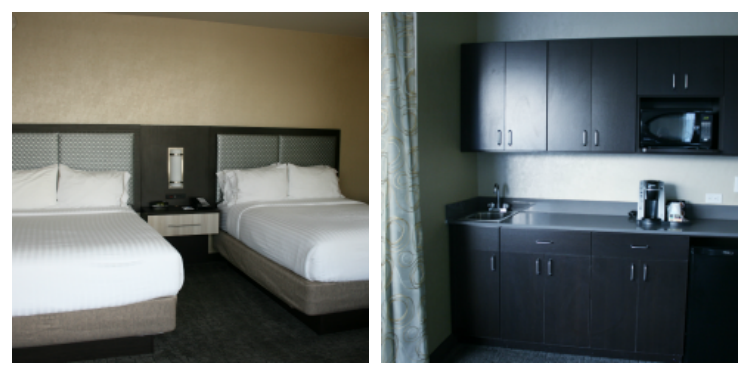 The room was new and clean without any visible wear and tear that is often seen at other Anaheim area hotels. 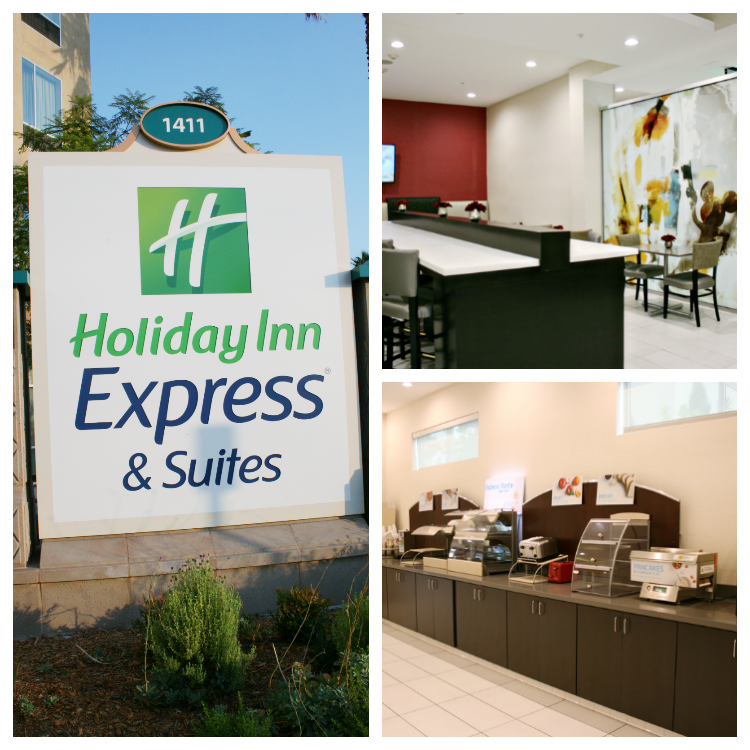 Our overnight stay at the Holiday Inn Express was fantastic! The staff at the front desk was very friendly and greeted us each time we came and went. I would most definitely stay here again and experience more of the amenities including the pool and toddler splash pad. 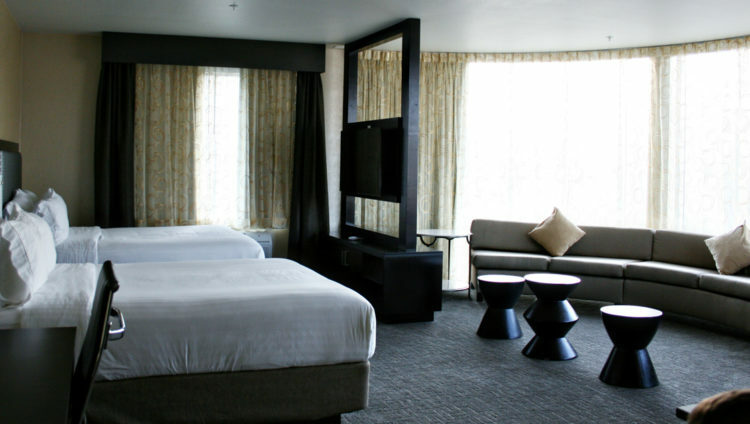 The large room and extra space as well as the cleanliness and complimentary breakfast was a plus. The value of the Holiday Inn Express & Suites in the Anaheim Resort area when compared to other hotels that are located within walking distance of the Disneyland parks is exceptional. I highly recommend a stay here next time you’re in need of an Anaheim area hotel. Julie Bigboy is a Southern California native who loves exploring sunny San Diego with her husband and four children (aged preschool to teen). With much to see and do in SoCal, Julie and her family are day trip experts, usually returning home after a day of fun. Julie writes about positive parenting, family travel and healthy living on her site, Mom Rewritten. What is the view like? It must face the park if they claim you can see fireworks? The room that we were in did have windows that faced the park. Unfortunately we weren’t there to see the fireworks but yes, we definitely would have been able to see them from the windows.